Provide child care before, during and after school while parents work. Inculcate knowledge and skills required for college (and ensure they can get into good colleges). Feed children that don’t get a decent breakfast at home. Help students deal with emotional and psychological issues. Help students with a broad assortment of disabilities prepare to participate in society. Address major gaps in learning and bring them up to grade level. Address the learning and language needs of students who may speak one of dozens of foreign languages and help them assimilate into American society. Prepare students for factory-like jobs. Today’s schools continue to be asked to prepare students for jobs, but the jobs have changed. Current jobs and the jobs of the future require creative and critical thinking. As pedagogy shifts from information consumption to the development of 21st-century skills, the concept of student agency is gaining importance. Student agency is a job that is not being fulfilled at all in most educational institutions. There are some that make agency their highest focus, but in so doing they do not always fulfill some of the other jobs of schooling–such as academic preparedness–well enough that they are considered a mainstream alternative to public schools. Disrupting schooling is different than disruption in the classical sense. Generally, disruption means creating a lower-quality offering than the incumbent, but one that fulfills a job that is not being done by the incumbent or anyone else. A canonical example is the transistor radio that was lower fidelity than the high-end equipment of the time but enabled young people to take their music with them anywhere they went. Schooling can’t follow this model because an offering that doesn’t meet all the requirements of the incumbent won’t be acceptable to our society. Using adaptive software allows students to work at their own level and pace, through their own path, any place, any time. Using the tools and access of technology to enhance and scale agentic (fostering agency) pedagogies such as Inquiry, Project-Based Learning, Design-Based Learning and more. However, in addition to the restrictions of a hybrid model of disruption, there are additional obstacles in the schooling system to the transformational adoption of these practices. Using adaptive software is the easier of the two practices. It can be incorporated into the more basic station rotation model of blended learning, and with high-quality products such as ALEKS and ST Math, teachers quickly see feedback that the approach is working with students and begin to trust that they can work at their own pace. This skill-building, when practiced to automaticity, also provides a foundation for unleashing creativity. However, to reach the full potential of adaptive software, the very structures of school that separate students into grades and measure seat time rather than mastery must be overcome and this is significantly more problematic and beyond the scope of this discussion. 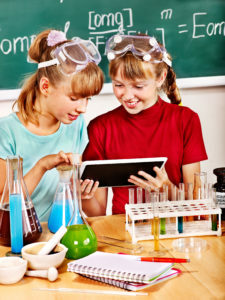 The more challenging use of blended learning comes when implementing agentic pedagogies, such as when students use technology to research questions in an Inquiry model or use tools to collect data and do an analysis for project-based learning. These pedagogies require a shift in mindset on the part of the teacher and a giving up of control that is extremely difficult. What tends to happen instead is that the teacher will fulfill the form of agentic pedagogies while missing the substance. They end up quashing student agency rather than fostering it, even while they genuinely believe they are engaging in agentic practices. One way to overcome this dilution of innovative ideas is to get teachers to focus on student agency, rather than on the tools that are used to achieve it. In our practice, it has been incredibly difficult for teachers and administrators to make a wholesale shift. Instead we encourage districts to create a formal improvement process that allows teachers to grow into agentic teaching in small, incremental steps that are more easily digestible for teachers. This process gradually allows teachers to see results of agentic teaching without taking too big a risk at one time. It gives them an ongoing feedback cycle that is non-threatening, so that they can give up a little control at a time and have students take ownership of their learning in a way that makes that control unnecessary. Over time, small incremental changes add up to compound-interest-like results. We understand that district systems often impede these type of practices. Therefore, we see the Formal Improvement Process as a mechanism that can eliminate one of the barriers to blended learning in its more transformational form and will accelerate the disruption of the traditional classroom.